Havas Life Dusseldorf has appointed Dirk Poschenrieder as its new managing director, a role that will see him continue the firm’s efforts on defining its business strategy and operations. Prior to his new role, Poschenrieder spent the past three years leading the healthcare business unit at communications firm Territory. He said: “I couldn’t be more excited to join Havas Life, one of the largest fully integrated, global health communication groups. “Havas Life delivers first-class health communication which is both creative and effective and together with a fantastic team we are going to shape the future of health. With more than 20 years of experience in health marketing Poschenrieder has worked for companies including Janssen (J&J) as its digital marketing manager and at Razorfish Health as digital strategy director. 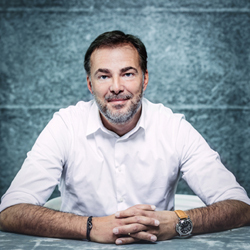 Alfonoso Formariz, regional director Europe, Havas Health & You, said: “Dirk brings with him great experience in managing and developing business and a depth of expertise across strategy and digital in healthcare, which will help us continue moving to the next level.